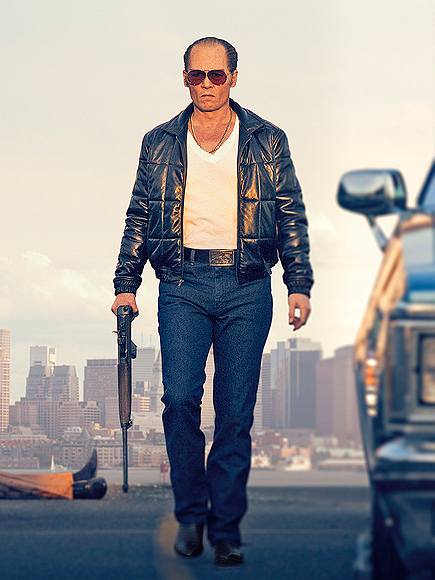 I have been enthusiastically looking forward to Black Mass, the biopic of the notorious Whitey Bulger, since I first heard about it earlier this year. From a cinematic view point, with Scott Copper directing and Johnny Depp in the lead, it definitely evoked my interest. I enjoyed Coppers last two features Crazy Heart (2009) and Out of the Furnace (2013).I was also looking forward to seeing Depp back in a Gangster film after his stand out roles in Donnie Brasco (1997) Blow (2001) and of course Public Enemies (2009) when he played another of America’s most infamous of Gangsters, John Dillinger. From a story stand point it simply doesn’t get as enthralling as the life of James “Whitey” Bulger. However, and maybe it was due to my enthusiasm for its release, but I must admit to being disappointed! Another reason why I found it so weak might have been because I have seen and loved the excellent documentary about Bulger by director Joe Berlinger - Whitey: United States of America v. James J. Bulger (2014). If you want to get informed about the fascinating life of Bulger, and watch a well-made doc at the same time, then that’s the one to watch. So what is wrong with Black Mass? For me there was no build up, no real development of characters which resulted in me not really caring about any of them. It was over loaded with the usual Gangster genre tropes of beatings and senseless slayings. I could go on, but there are good things about it also it wasn’t all bad. The main performances by Depp and Joel Edgerton who plays John Connelly are strong and to be fair, there are a couple of captivating scenes especially when Depp turns cold, unfortunately though it ends there. Although I wouldn’t really discourage anyone from going to see Black Mass because I am sure there will be people who will relish it. For me however it was just ok.
Steve Jobs is the latest film from Danny Boyle, a director I have consistently liked, and with an impressive oeuvre of films to his credit including Trainspotting (1996) and 28 Days Later (2002) I’m sure I am not alone. When I heard that he was to replace David Fincher and team up with writer Aaron Sorkin to make a film about Steve Jobs I was excited, albeit a little disappointed that Fincher had pulled. Boyle and Sorkin have created a very interesting film, that is quiet dissimilar to The Social Network (2010) the last film about a tech mogul that Sorkin penned (and Fincher directed). Steve Jobs has a very precise three act, real time structure which I really enjoyed, but while it worked for me it might not be to everyone’s taste. In the demanding lead role is Michael Fassbender, he is literally in every frame and not once did I tire of or disbelieve his character, which is extremely hard to pull off as an actor. Like all Sorkin scripts there are many intense, dialogue heavy scenes between characters but they are all brilliantly directed and acted. Along with Fassbender there are strong performances from Jeff Daniels who plays John Sculley, Kate Winslet playing Joanna Hoffman and Seth Rogan who gives a forceful performance as Steve Wozniak. There are many people stating that the film is unkind to Jobs, showing him in a bad light, however in my opinion the real Jobs was a far more horrible individual then Michael Fassbenders portrayal. To get a deeper grasp of Jobs I would recommend Alex Gibney documentary Steve Jobs: The Man in the Machine (2015). Horrible or not he was a man who was certainly committed to changing the world to his vision, he believed that empowering people with knowledge and technology would do just that. This is an entertaining film that explores a very fascinating character, it might not be to everyone’s taste but it was certainly to mine. To be fair Nick Hornby has done a good enough job of adapting this Colm Toibin novel into a screenplay. The original novel does have a less ‘sugary’ feel than the film but all in all Hornby has succeeded. Brooklyn follows the life of protagonist Eilis (Saoirse Ronan) a young girl who crosses the Atlantic to America in the 1950’s for a better life (as many Irish did at the time). Eilis finds herself homesick and struggling in this brave new world. Eventually we see her begin to adapt to her new life only to be caught up in a love triangle which highlights the struggle between her love of home and her love for her new life, the old classic old Vs new. I am not going to say anymore about the plot, I will however say there isn’t really anything new here. This might be unpopular with some but I feel I have seen this film a thousand times and it verged on being a little boring for me. If you fancy a very watchable romantic film to go to and while away a few hours then go see Brooklyn but do not expect to be blown away.